Multi-disciplinary Belgian theatre-maker Marieke Dermul wants to enter Eurovision 2019 with her European Citizen Popsong – an anthem combining musical influences from across Europe. A song that will revel in a shared European identity. A tune that will reinvigorate the dream of European unity after the knocking it has taken in recent years. 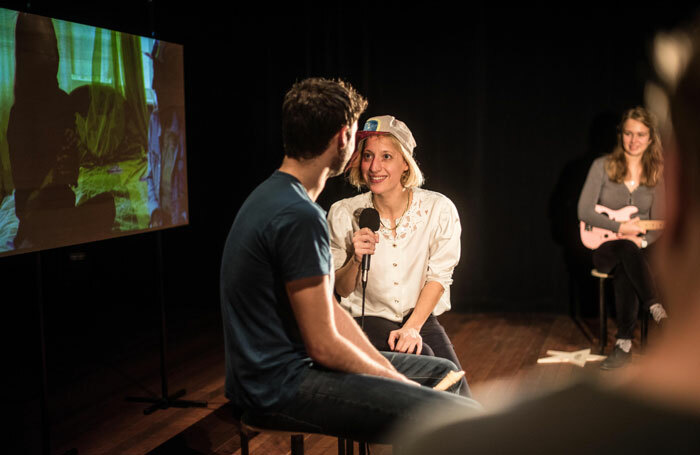 In her Summerhall show – in Edinburgh as part of the Big in Belgium programme – she enlists the help of the audience, casting spectators as members of her band and staging conversations with them, interspersing these interactions with short video clips of her exploits interrogating opinions across Europe. But for all Dermul’s kooky charm as a performer, there’s not enough genuine substance here to power an hour of theatre. It’s fun watching her interrogate Eurovision suits about the competition rules, and its fun seeing her perform snippets of her song in random European locations, but you keep expecting her to dive deeper into the history or the politics of European identity. And she never does. Dermul handles her audience with upbeat, unintimidating friendliness – no one ever begrudges becoming part of her band – but European Citizen Popsong just doesn’t have the content to back up its concept. It’s a bit silly and a bit superficial.